Congratulations and way go Bob! The organizers of the Trurkey Trot say there were over 2100 registrants for this event. The picture of the bib number is a nice touch here. As if weren’t already enough that you sing, dance, and act. Now you’re showing prowess as an endurance athlete as well. Keep up the great work. Your readers look forward to reports of future success. Congratulations and way go Bob! 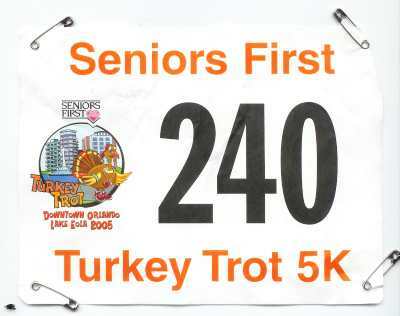 The organizers of the Trurkey Trot say there were over 2100 registrants for this event. Your picture of the bib number is a nice touch. As if it weren’t already enough that you sing, dance, and act. Now you’re showing prowess as an endurance athlete as well. Keep up the great work. Your readers look forward to reports of future success. Sorry I somehow messed up and sent previous post twice. BTW, of the over 2100 registrants there is no record of how many of them actually were able to finish the full distance. Yippee! We are so proud of YOU! Congratulations — very impressive. And bet you really enjoyed the turkey and mashed potatoes later in the day! Congratulations! The Turkey Trot is always a nice way to get the community (and some other people) to work together. This was fun since there were many participants. And you won!